Through kiln feeds to finished blends, cement producers were responsible for about 12 percent, or 8.6 million tons, of total CCP recycling last year. In 2016, they logged 4.8 million tons, or 8 percent, of the 60 million tons of ACAA Production and Use Survey recycled material. Concrete producer representation in total CCP recycling is down slightly year-over-year, from about 25 percent, or 15.3 million tons, of the 2016 total, to about 21 percent, or 14.9 million tons, last year. Adding most of the 8.6 million tons of CCP recycling upstream of ready mixed and precast plants, however, provides a more impressive figure for concrete. “The trend for coal ash beneficial use continues to be very positive,” says ACAA Executive Director Thomas Adams. “For the fourth straight year, we have seen significant improvement in the beneficial use rate.” The association compiles CCP data by directly surveying electric utilities and utilizing additional U.S. Energy Information Administration figures, he adds. The 2017 Production and Use Survey shows 71.8 million tons of CCP beneficially used out of 111.3 million tons generated. The 2016-2017 rate of ash recycling or utilization increased from 56 percent to 64.4 percent; total material consumed in cement, concrete, gypsum wallboard and smaller volume applications climbed 11.6 million tons. Increasing CCP beneficial use levels challenges fly ash marketers to ensure that products are consistent and available when customers need them; commit to large investments in technology and logistics; and, deploy technologies and strategies for harvesting previously disposed stock. The two main sources of ASTM C618-grade fly ash are responding accordingly. As we noted in October (“Boral transforms sub-grade ash to performance, lightweight aggregate,” page 16), Atlanta-based Boral Resources will extend CCP recycling and fly ash output through licensing of a lightweight aggregate process converting low-grade CCP to ASTM C330- or C1761-level product; and, beneficiating ash in Pennsylvania extracted from the site of a former generating station. 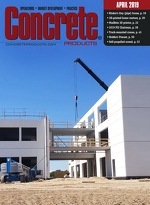 Announcing the sale of its Colorado ready mixed (“Brennan expands Front Range reach,” June, page 18) and Texas concrete masonry businesses (“Boral Exits Block,” page 18 this month), Boral Ltd. indicates a narrowing North American market focus on fly ash and building products. Kentucky-based Charah Solutions Inc. has had a milestone year. A New York Stock Exchange debut in June (“Public offering places Charah on Wall Street,” July, page 44) coincided with continuing ramp up of fly ash supply capabilities, including the launch of the MP618 Multi-Process for low-grade feeds (November Briefs, page 30); and, expansion of the MultiSource distribution network (“Oklahoma Partnership,” page 22 this month), which has grown to 30-plus locations. Availability of Boral asset sale and Charah initial public offering proceeds, coupled with cement and concrete producers’ unmet fly ash demands in certain markets or regions, suggest that 2019 will bring more projects boosting ASTM C618 product availability, as well as CCP recycling benchmarks justifying increasingly upbeat ACAA Production and Use Surveys.